Since we created the Whole30 in April 2009, thousands of people have told us that this line is what finally motivated them to start the program and change their lives. If you’re the kind of person who responds well to tough love (for which the Whole30 is famous), this line was written for you. It’s a well-meaning kick in the pants to put this challenge into perspective, retire your excuses, and start owning the changes you want to make in your life. This is not hard. You’ve done way harder things. You can do this. It’s just one month. We’ll always leave that line untouched, because it speaks to where we were when we created the Whole30, and the many people that message has inspired. Now, we want to share something else. We know this is hard. It may not be as physically challenging as birthing a baby or as emotionally draining as the death of a loved one, but changing the way you think about food is hard. 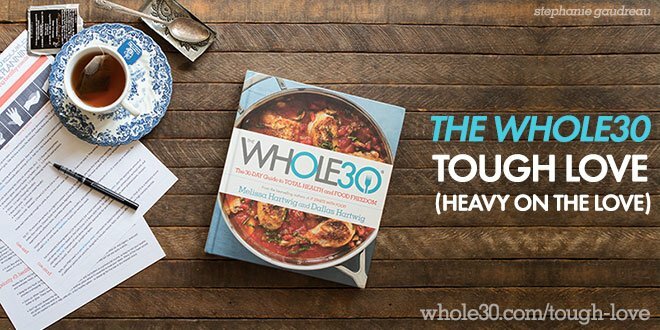 The most famous line in the #Whole30: ‘This is not hard.’ Still, we KNOW this is hard. Our relationship with food is an emotional one. Food is our comfort, our reward, a trusted friend, a mother’s love. You’ve got food habits, traditions, and associations that go back to childhood. You can’t imagine how you would live (happily) without certain foods in your life. And we are asking you to give up those foods for an entire month. Yes, the idea is threatening. Scary. Downright paralyzing. How will you celebrate, manage your stress, deal with a tough day at the office, bond with your family, enjoy life without cake, chocolate, wine, or bread? We’re not even going to mention cheese right now. If the Whole30 was just another diet, a short-term quick fix, or a 30-day test of willpower, it would be easier. You can do anything for 30 days, and believing you could return to your old habits and foods a few pounds lighter when the month was over would make temporary restriction easier. But the Whole30 is not a diet. It’s not a quick-fix. It’s not even a weight-loss program. The Whole30 is designed to change your life. It’s a monumental transformation in how you think about food, your body, your life, and what you want out of the time you have left on this earth. It’s so much bigger than just food. It’s a paradigm shift the likes of which you may only experience a few times in your whole life. Big changes like that are always hard. So we need you to know that we understand. In fact, that’s exactly why we wrote The Whole30: The 30-Day Guide to Total Health and Food Freedom. Because we know the Whole30 is hard, and we want you to be successful. We want to teach you as much as we can in the next 30 days so that you will succeed in changing your life. Improving your sleep, energy levels, mood, attention span, body composition, motivation, self-confidence, self-efficacy, and quality of life starts by changing the food you put on your plate. Yes, the Whole30 eliminates cravings, corrects hormonal imbalances, fixes digestive issues, improves medical conditions, and strengthens the immune system. But the program will do so much more than you are expecting it will do. We know that, because we’ve seen it happen with thousands of people. The #Whole30 program will do so much more than you are expecting it will do. What starts off as a “diet” somehow expands into other areas of your life, areas you didn’t even know could be improved simply by eating good food. The next 30 days will initiate a healthy chain reaction throughout your entire life, imparting a sense of control, freedom, stability, and confidence that will inspire you to take on other personal development goals, big and small. You’ll feel better, so you’ll want to do more. Which makes you feel even better, and want to do even more. It’s the exact opposite of the cycle you’ve been stuck in—feel bad, eat junk food, feel even worse, eat even more junk food. We carefully designed the Whole30 to jump-start new, healthy habits, and keep you moving forward in a positive way more consistently and sustainably than any quick fix weight loss diet ever could. It will be hard. You will not be perfect. Don’t even try to be perfect. No one is judging, no one is keeping score, and there are no penalties for admitting that this is hard, you are struggling, and you need help. Be patient with yourself, because real change takes time. Be kind to yourself, and celebrate even the smallest of victories, because a series of small victories is all it takes to change your life. Finally, know that it’s not 30 days—it’s one day. One meal. One bite. Do this one bite at a time if you have to, because it’s for the most important and worthwhile cause on earth—you.